Beet is useful and very beautiful product. 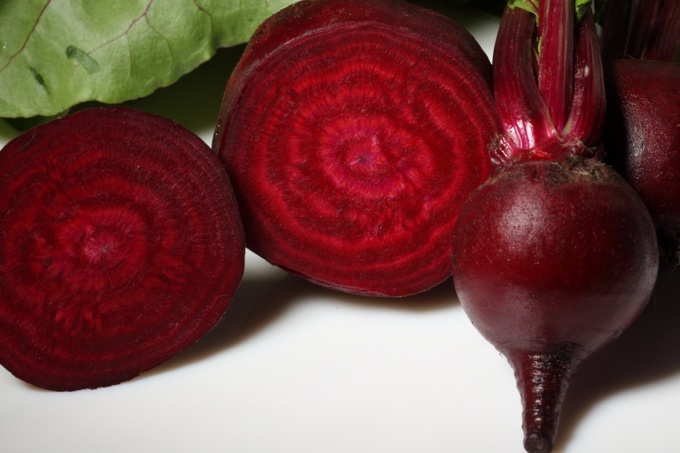 The rich color gives this root vegetable betaine, which reduces the risk of cardiovascular disease. Her bright beauty used by cooks around the world for cooking and decorating. One of the most famous dishes with beets – borscht. Recipes it is impossible to count. Often when cooking – boiling, frying, braising the beets loses its brightness and becomes brown. Because of this, and the sight of all the dishes that careless and alapetite. Save the "original" color of the soup can, knowing some tricks. Grate the beets on a grater and sprinkle well with salt, stir. Leave it until the salt dissolved. Broth salt quite a bit, or do not salt at all. To fix the color, add the vegetable oil. Prepared cook the beets separately from the vegetables. Add the soup simultaneously with the potatoes. Spray them finely chopped or grated in a coarse grater beets vinegar, diluted with water. Boil the beets in a little acidulated water. Clean, finely cut into strips. Add the soup about 10 minutes before the end of cooking. Saute the beets with the addition of tomato paste. Pasta can be replaced and fresh tomatoes, but the effect is smaller since they lower the concentration of lycopene, which makes tomatoes "blush". When fighting, you can add a little vinegar (or table grape), lemon juice or citric acid. Try instead of acid, add sugar. About 1 tsp per 2 liters of water. Just add to boiling water, and it is better to put it in chopped beets prior to cooking. The taste of the soup will be more interesting. Touch up borscht beet kvass – fermented beet juice. It may be cooked in advance. Wash and peel the beets. Cut it into slices of medium thickness. Cover with cold water and leave in a warm place. After 6 days store in the refrigerator for 2-3 days. The juice should be thick and have bright saturated colorOhm. Strain and add to the finished soup, immediately cover and remove from heat. You can make this brew and in a hurry. To do this, grate the peeled beets, place in a small pan. Add 200 ml of broth and lemon juice or acid. Bring everything to a boil, stirring frequently. Boil 2-3 minutes, cover and remove from heat. After 30 minutes, strain and add to soup. If you to preserve color, use beet kvass, do not add any other acid. The best varieties for the heat treatment are those that have slightly flat roots and darker skin. Beet is better to cut the strips along. Prepared for the future beet kvass can be stored in the freezer in small plastic containers.